The History Channel announced a premiere date for the upcoming miniseries Six, currently filming in Wilmington, North Carolina, at the annual TV Upfronts this week. Six had filmed almost two of its eight-episode order when production was abruptly shut down for Manganiello to address an undisclosed health issue. There is currently no restart date set to resume filming, but Manganiello’s scenes have since been reshot with Walton Goggins in the role of Rip Taggart, described as a gruff, haggard, and aggressive military man who was once the squad leader of Seal Team Six. Six also stars Barry Sloane (Revenge), along with Dominic Adams, Edwin Hodge, Kyle Schmid, Juan Pablo Raba, Nadine Velazquez, and Brianne Davis. Earlier today, Sloane posted the below photo on Instagram and revealed that Six will air premiere on Monday, July 18 at 10pm EST. So there you have it! Who else will be watching Six this summer? #Six Premieres on July 18th 2016 – We are currently filming the 3rd part of 8 and it is truly the most unique filming experience of my career to date. We started this journey at the beginning of the year at @sealfit and through that experienced something that @iamkyleschmid @juanpabloraba @chaoticsymphony @donnyboaz @jaylen1118 and I will never forget. Thanks to @mitchelldhall for having us take a long hard look at ourselves as men prior to telling the story of these warriors. Recently we have been joined by our brother @waltongogginsbonafide who is a master of the craft and drives this show forward with passion and aggression. 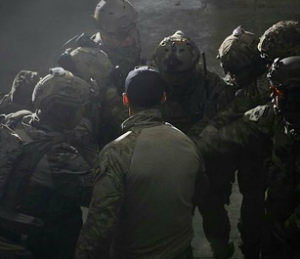 But the SEALs are only a part of this show, the whole cast are amazing and our Writers, Producers and Directors are creating a truly unique perspective on this ongoing war, showing the cost to the soldiers, their families and the American people. I URGE you to get the word out about this show. #Six #SixOnHistory #NavySeals #Hooyah ?? ‘Shots Fired’ First Official Trailer Released!